The aim of this paper is to discuss the dialectic form-finding of a complex timber structure based on an innovative structural system: shell-nexorade hybrids. Nexorades, also known as reciprocal frames are elegant structures that suffer from a relatively poor structural behavior due to in-plane shear and bending of the members. Introducing plates as bracing elements significantly improves their performance, but increases the manufacturing complexity and sets high tolerance constraints. We present the fabrication and assembly of a 50 m2 timber pavilion with 6-axis robotized milling. 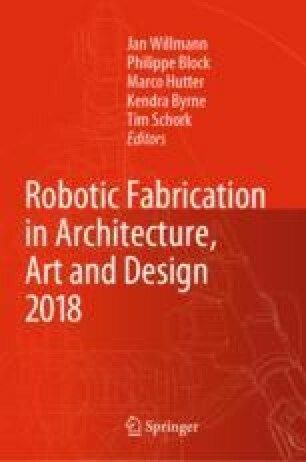 The use of a mobile robot and fixed machining stations is explored to allow for maximal flexibility of iterations between design and fabrication.